In April 2017, the atheist Communist Party issued ‘Naming Rules for Ethnic Minorities’, banning 29 names, including Muhammad, Islam, Jihad and Hajj. China has established more than 21 ‘political re-education centres’ in its Xinjiang Uyghur region, to “re-wire the political thinking of detainees” who are largely Muslim Uyghurs, according to depositions by a US Congressional Executive Commission. The ‘political re-education centres’ — modern China’s version of erstwhile Soviet-era Gulags — have expanded in recent months. The expansion has coincided with the tenure of Chen Quanguo, who was appointed to head the Communist Party of China (CPC) in the region two years ago. 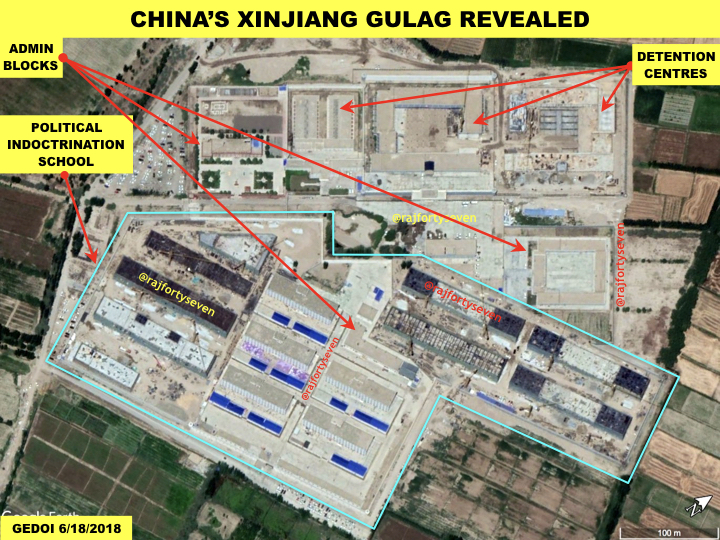 ThePrint uses satellite imagery sourced from Google Earth to examine what is happening in Xinjiang, and focuses on one particular re-education centre. In April 2017, the Communist Party of China (CPC), which officially subscribes to atheism, issued a diktat — “Naming Rules For Ethnic Minorities”. It banned at least 29 names, including Muhammad, Islam, Jihad and Hajj. Chinese authorities claimed the ban was imposed because of “divided consciousness and religious consciousness”. No baby born after 17 April, 2017, could be have a name from the proscribed list. Persons born earlier had to drop these names from their official documents. A most interesting decision to drop the name Muhammad came from the Chinese deputy chief of mission in Pakistan, who changed his Twitter name from ‘Muhammad Lijian Zhao’ to ‘Lijian Zhao’. Chen Quanguo, after impressing with his performance in Tibet, took charge as the CPC secretary responsible for Xinjiang Uyghur in August 2016. The ‘re-education’ schools were begun and expanded under his watch. They are basically detention centres for political indoctrination. People who tow the CPC line and agree to government diktats are dealt with leniently. Others are either punished, tortured or put in prison without charges. There are at least 28 such schools built under the leadership of Chen Quanguo, noted the US Congressional deposition, citing data surveillance. The biggest of these is in Shule County, 15 km southwest of Kashgar, the largest Uyghur city. The ‘political re-education centre’ in Shule County near Kashgar, as it appeared on 18 June 2018. The facility began as a small jail for politically ‘incorrect’ prisoners in 2009. Till the arrival of Chen Quanguo in 2016, it was a minor establishment. There were just a couple of buildings at the site in May 2012 (top left). A new building was under construction in February 2017 (top right). Since then, the site has expanded at a super fast pace. This particular facility has grown remarkably since early 2017, around the time when the cultural diktat on names was issued. The construction of the facility is unique. The basement was built and then filled with compressed earth. This is probably done to ensure that inmates cannot dig tunnels through its walls or floors to escape. The basement of the detention centre has been filled with compressed earth. The buildings have been constructed with modular techniques. The buildings are constructed with modular techniques, using prefabricated steel braces that were implanted with cranes and earth movers. Individual modules also have steel frames that strengthen the buildings. This permits speedy construction of buildings at a cheaper rate since most work is done by machines that are faster compared to manual labour. In June 2017, one rectangular double-storeyed prison building was completed. It measures 102m x 80m, and is possibly used to keep political prisoners. Right opposite this complex is one which possibly houses the ‘re-education school’. It measures 70m x 15m, and features four-storeyed structures with 21 windows on each floor, indicating 42 rooms of 6m x 3m. Another single-storeyed building possibly serves as an administrative barracks. Thus, at any time, a minimum of 800 so-called “students” could be accommodated in 2017. The latest Google Earth image, from 18 June 2018, shows that an additional rectangular double-storeyed prison building (of the exact same size as the previous one) is being constructed, as are seven more “re-education” school buildings of 130m x 20m size. These new buildings would increase the capacity to at least 3,000 inmates. The rectangular buildings with maximum security are likely to be detention centres for political prisoners. The entire facility is surrounded by a triple-layered fence, with the one in the middle being solid 1.75m thick and almost 10m tall. Most turnings have a covered circular sentry post on top. There is a path for movement between the posts. The facility is surrounded by a triple-layered fence, with the one in the middle being solid 1.75m thick and almost 10m tall. The inner and outer fences are made of barbed-wire, approximately 4m high. Beijing is enforcing a culture in such fortress-prisons that could wipe out people’s own markers of faith and unique way of life. This is how ethnic cleansing takes shape.